Arizona Watersports celebrated 20 years of being a Chamber member with a ribbon cutting by the Lake Havasu Area Chamber Ambassadors. Holly and Blaine Hitchins have been serving Lake Havasu and Parker for over 20 years offering their customers a large selection of rental pontoon, deck, ski and jet boats as well as Yamaha Waverunners including the 4 stroke FX140s and VX110s. Arizona Watersports is located at 655 Kiowa and can be reached by calling 453-5558. 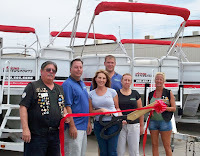 On hand for the ribbon cutting from left to right were: Mike Schuler, Blaine and Holly Hitchins, Ken Little, Kathy Clark and Jen Whetten.